The new weekly BIG SING! 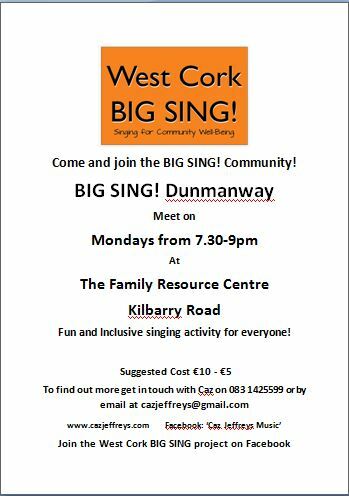 group for Dunmanway starts next Monday 2nd November from 7.30-9pm at the Family Resource Centre on Kilbarry Rd. Along with the new and varied set of songs for the next BIG SING! event, this group will be bringing a collection of more unusual Christmas songs along to the Tree of Remembrance Ceremony on 19th December on the square. < Previous A Right Ol’ Song and Dance! Next > Next Bantry Singing session with West Cork BIG SING!